It’s almost Easter, so let’s start the weekend early this week. That’s right, kick off at White Rabbit’s traditional Thursday nights in Club Up. After successful events in the Sugar Factory, VLLA, Woodstock69 and Studio 80, these creative guys decided to pay the almighty student night some more respect. Of course, accompanied with music by friends of the show Paul Sebastiaan & Teenageluck, La Vondèl and Henkst & Leanderthaler. Follow these guys all the way down the rabbit hole! Clone Records is the umbrella for a few sub labels, which bring you some of the finest records the international electronic landscape has to offer. Once in a while, electronic music all-rounder and label founder Serge throws a party in Trouw. This Friday, it’s that time again. He invited some very cool artists like Space Dimension Controller (live) and Morning Factory, of course Serge himself cannot miss out on this. De Verdieping will be open as well by the way, featuring Morgan Geist aka Storm Queen (if you’re there, you cannot miss out on this guy) all the way from New York, and local rock-stars Riso and Tim Hoeben. This Sunday we celebrate a special Easter edition of Rekorder. Why? ‘Cause everybody is free on Monday. But not only that, none other that the almighty boss of emo-electronica Gui Boratto will be present to celebrate this holiday with us! Even though I’ve seen the man play about ten times, I still get excited every time he has a gig planned in Amsterdam. Support comes from the lovely Miss Melera and Applescal (live), one of my of my personal heroes. AIR2 will be filled with a more tech-house approach from resident Wouter de Moor and the young Bram Fidder. As always, expect some intense visuals from Escapation. See you up front Amsterdam. 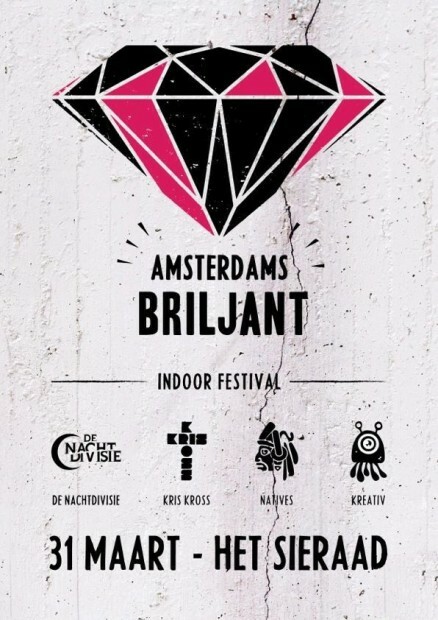 Finally, the ‘other‘ cool party on Sunday is Amsterdams Briljant, an event organized by four Amsterdam-based promoters: De Nachtdivisie, Kris Kross, Natives and Kreativ. Together they form an mini indoor festival at the wonderful location called Het Sieraad. One that you might remember from our past events. This time we’re the visitors. But let’s not forget the artists. Who are we talking about? Melon, William Kouam Djoko, L’Atelier, Terry Toner, PONY, Mulla & Mailman, Timothy Watt & Watt Jr. and many, many, MANY more. This week it’s literally a hangover on Monday folks. Enjoy it!